This review won’t be long, and I won’t make it fancy. 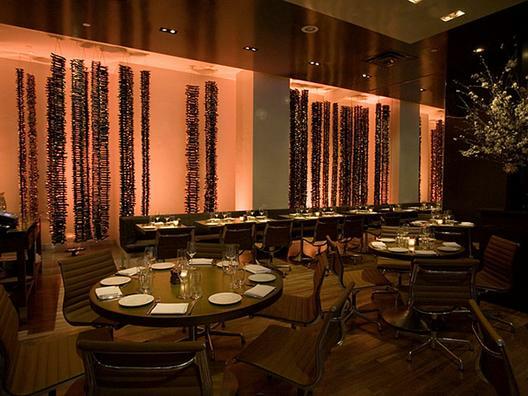 It’s been almost 24 hours since I left A Voce, the upscale modern Italian eatery in a strange part of the Flatiron district of Manhattan run by a former chef at Cafe Boulud, Andrew Carmellini. My body may have left there at 11PM Saturday, but my mind is still there right now. A Voce actually took my voice away at moment. Only long enough to concentrate on each delicious bite of food. We are not a couple who are able to afford many of the trendy/upscale restaurants in Manhattan. When my parent’s decided to come up for the weekend and treat us to dinner, we decided on to pick a place that we probably wouldn’t be able to afford alone. The reviews online of A Voce were mixed. So mixed that I was very close to canceling the reservations I made over a month ago. See, my father has a slight bit of a hearing problem (one he likes to think he doesn’t have) and about 85% of the review I read online talked more about the stupid chairs and the noise level of the restaurant instead of the food. Now, I know that city restaurants are loud, but the way some of these reviewers talked about the “insane noise” and (my favorite quote from a Chowhound.com user) how the “noise level is horrendous and conversing in normal tones becomes nearly impossible”, kind of scared me. Conversing in normal tones almost impossible!? Dem some strong words! I even read a review that talked about one of them losing their voice after a night eating there. If the food is excellent, how important is the conversation? To me, well, I’m Italian American. In my family, silence at the dinner table is worse than not going to Confession after you’ve talked back to your mother. Anyways, I am happy to report that even my partially deaf father conversed just fine with the three of us all throughout dinner. Maybe it was our table, maybe it’s cause we’re a loud family? Regardless, the noise level at A Voce was similar to any bustling NYC joint on a busy Saturday night. Now, on to the food. I could cry thinking about it. I’m salivating thinking about it. It was excellent. Unfortunately, we only sampled a very small bit of the menu because both my mom and dad weren’t super hungry. It’s white truffle season and a few moments after we were seated, our waiter came around with a box containing three medium-sized ones to view, smell and ogle over. My mom told me she almost took one and put it in her mouth like an appetizer because she didn’t know what it was. Gotta love her (but I would’ve slinked under the table if she did that!). Supposedly, truffles are going for $3000/lb these days. HA! I’ll take 2 pounds, thank you very much. There were some additions to the menu that were not listed on their website. One was the starter I had – Steak Tartare. I can not explain to you how beautiful and delicious this dish was. It was chopped meat, lightly seasoned and flavored with some white truffle and shaving of fresh Parmigiano laid on top. On the side was two toasted pieces of bread with a piece of lardo melting into it. I think I closed my eyes and moaned with each bite. My husband started with the Coppa di Testa (or sliced headcheese). It was basically like a thinly sliced chunky pate cut in rounds. He enjoyed this thoroughly. My father had a side order of broccoli rabe sauteed in garlic. He’s basically a connoisseur of broccoli rabe and thought it was excellent. The antipasti sizes were pretty large, although prices aren’t low. Mine cost $17, the husband’s was $9 and my dad’s side dish was $8. For our mains, my mother and I had the Pappardelle with Lamb Ragu. The ragu was sweet and chunky with some carrots and onions. The pasta was fresh and the portion size wasn’t too bad ($24). 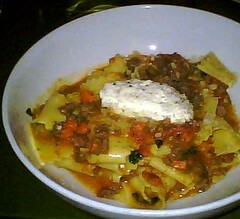 There was a dollop of homemade ricotta to round out the dish. My father had Crab Ravioli in a light tomato cream sauce. Fresh, homemade and excellent. Finally, my husband ordered the Country-Style Tuscan Tripe. 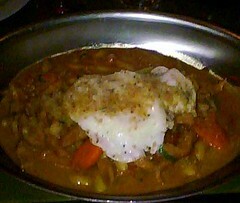 This was presented in a beautiful copper pot with a fried duck egg on top. It was hearty and reminded us of the many tripe dishes we ate this summer in Tuscany. The egg was a really nice touch and the sauce was ‘chooped’ up with lots of the fresh bread they kept bringing to the table. I can not wait to go back (after we save some money) to A Voce and try some of their other dishes like the octopus, tonno bianco and the duck. Their meatballs are supposedly top-notch as well. I highly recommend A Voce! **Sorry these pictures are such crap, all we had was our camera phone. Check out the rest of our restaurant reviews by clicking the tab above.